Comments and Articles on some of the important issues of our times from a bottom up perspective. We're all stakeholders. We're all in this together. Ashes to ashes, mud to mud. The UN World Water Development Report 2015, 'Water for a Sustainable World' was released in New Delhi on March 18th, two days before World Water Day and the Spring Equinox. Besides describing how terrible a situation our global freshwater resources are in it talks about how climate change is effecting weather patterns around the world especially in almost all of the world's most productive agricultural areas. 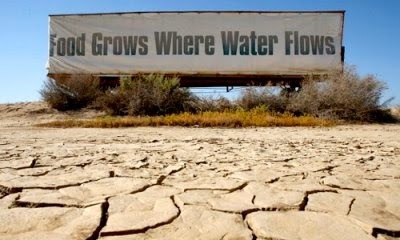 As the photos from California show, severe prolonged drought in the most productive area of North America combined with the skyrocketing debt incurred by industrial agriculture's practitioners has now led to plummeting groundwater levels as well as surface aridity. The combination of the two aren't unique to S. California and N. Mexico, it's the same story in Australia, India, N. Africa, S. China, Central America and N. South America. What this means to us up here, where British Columbians currently spend 11% of household income on food, is that the truckloads of cheap tomatoes from California rolling across the border won't last much longer. Despite that most folks here in BC have adopted the ostrich defense strategy and as long as those trucks keeping rolling north from California and Mexico they won't question the idiocy of flooding the best farmland in the north in order to line the pockets of the few rich BC Liberal supporters. The Site C Dam is just another pack of lies whose actual purpose to the transfer of the people's hard earned money into the hands of the rich. The damned supporters include those on the receiving end of $1.5+ billion windfall in interest payments at the Bankers and Billionaires Club, the concrete and steel tycoons, the big unions [who've never seen a mega project they didn't love], the stock market speculators, the equipment producers, the Chamber of Commerce types etc., who all have have a vested interest in the idiotic scheme. 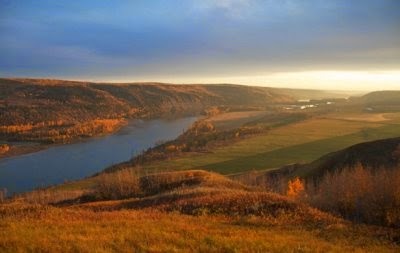 If the Site-C monstrosity is ever built, it would create the single largest loss of land in the 40-year history of the province’s Agricultural Land Reserve (ALR) – drowning or severely impacting over 30,000 acres of the Peace River Valley’s “extraordinary” farmland, land whose exceptional alluvial soil agrologists say could feed a million people. The battle to save the Peace River Valley from this unnecessary and destructive project is far from over. Six lawsuits have been launched against the federal and provincial governments with regard to Site C. The cases are solid and will set important precedents in environmental assessment in Canada if any of them succeed. The Stop Site C website in a great resource for following the progress of these cases and feeling the pain of those under the gun of the 'developers'. From a realistic economic assessment like the Suzuki Foundation study titled 'The Peace Dividend', the first study of its kind that quantifies the enormous natural wealth in B.C. 's threatened Peace Region, the project is sheer stupidity. The report concludes the economic benefits of keeping the Peace River region's remaining farmland and nature intact are enormous. Saying, "These ecosystems play a critical role in providing clean air, clean water, habitat for wildlife and many other ecological benefits that sustain the health and well-being of local residents, and contribute to the cultural and traditional ways of First Nations." Queen Clark may think that that Site C is a done deal, but she’s hugely mistaken. This disaster must be and will be stopped by the people of the Peace River Valley and all its cultures backed up by the good people of BC and Alberta who know that the future lives of their children and grandchildren depend on the living soils not profits for political backers. Be it in the courts or on the ground, we the people will Stop the Site-C Dam. The much watched and widely acclaimed video below explains why the $9billion mega project is far from a done deal. The commentaries and posts here are written and published by Bob Wiley from the hideout in Black Point. The goal of The Mud Report is to help provide leadership from the bottom. 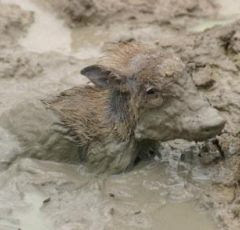 "Bokonon made mud. Bokonon said to some of the mud, "Sit up!" "See all I've made, the hills, the sea, the sky, the stars." And I was some of the mud that got to sit up and look around. Lucky me, lucky mud. I, mud, sat up and saw what a nice job Bokonon had done. "Nice going, Bokonon. Nobody but you could have done it, I certainly couldn't have. I feel very unimportant compared to You. The only way I can feel the least bit important is to think of all the mud that didn't even get to sit up and look around. I got so much, and most mud got so little. Thank you for the honor!" Now mud lies down again and goes to sleep. What memories for mud to have! "What interesting other kinds of sitting-up mud I met! I loved everything I saw! Good night. Amen."